Anyim Pius Anyim, Secretary to the Government of the Federation The Secretary to the Government of the Federation, Sen. Anyim Pius Anyim, has said that the Jonathan administration created the opposition movement as a deliberate attempt to deepen democracy in the country. Anyim said this at a Presidential dinner organised by the University of Port Harcourt (UNIPORT) Alumni Association in honour of President Goodluck Jonathan in Abuja on Tuesday. The SGF, who represented the president, said that the Jonathan’s objective in politics was not to remain perpetually in power but to expand the political atmosphere for wider participation. “We created the political opposition movement. The opposition movements owe their existence and activities to President Goodluck Jonathan. “I can assure you that President Goodluck Jonathan has vowed to deliver the dividends of fundamentals of democracy in Nigeria,” he said. According to him, neither the ruling Peoples Democratic Party nor the Jonathan administration is scared about the rising opposition movement. “We are enjoying what is happening. We created it. The enhanced political environment is what the opposition is enjoying. “If they abuse it, do not mind. It does not matter. It does not challenge us,” the former Senate President said. He said that one thing that the transformation agenda of the administration had introduced “is that we not only work for today. We plan and work for the Nigeria of tomorrow”. Anyim said that since 1999, he encountered three presidents, Olusegun Obasanjo, Umaru Yaradua, and Jonathan, but added that only the Jonathan administration offered what the people wanted to advance the nation. “Since the beginning of democracy in 1999 I have played an active role. I have encountered three presidents. “My tenure as Senate President was greeted by the struggle to guarantee the independence of democracy. “Under Jonathan, I played a role in the democratisation process of our polity, which is actually the content that democracy brings to what one asks for.” Accordingly, he said that Jonathan had instituted the fundamentals of democracy, adding that what Nigerians often demanded were the “incidentals of democracy” which could only thrive under good foundation. He said Jonathan had etched all fundamental freedoms into the lives of Nigerians although the opposition tried to trivialise them, including heaping undeserving insults on the person of the president. 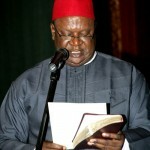 “If you do not have the freedom to speak, the basic idea of achieving the fundamentals will be lacking,” Anyim noted. He said the administration had transformed virtually all spheres of the economy and likened the Jonathan’s feat to an elephant “which from any side you begin to cut, you must have meat”. He said for the nation to consolidate on the gains, the electorate should re-elect Jonathan whom he described as a man of vision. Education Minister Ibrahim Shekarau, who was the chairman of the occasion, said that Jonathan “has been an achiever”. Shekarau said that the administration had provided unfettered access to education and raised the quality tremendously. He said under the administration, no fewer than 130 functional Almajiri schools, 12 brand new universities with nine in the north and new polytechnics had been created in the past four years for even development. The minister said the creation of TETFUND by the administration had raised the quality of infrastructure and training in tertiary institutions to an unimaginable level. He said that with the level of training of academics in the university “the target is that in no distant future all lecturers in the university will have minimum of doctorate degree. Earlier, the President of the UNIPORT Alumni Association, Chief Sampson Ngerebara, said that besides the turnaround in the economy, Jonathan, in spite of attacks had remained humble and worked for peace and security of the nation.